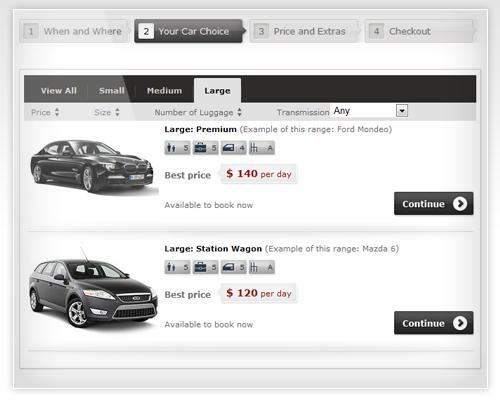 StivaSoft offers a complete online booking engine for rent-a-car websites and companies. Car Rental script is a professionally developed PHP script which allows you to integrate a car hire and rental system into a website or content management system using only a few lines of code. The script is designed as a powerful and intuitive online booking system which allows site users to book a car with a few easy steps. A reservation management module is integrated into the car rental script providing administrators with full control over the reservation process and bookings. A car management module gives you the ability to manage vehicle details, extras, pick up locations and car types. The car rental booking system is a popular choice for a customisable and easy to use booking system for a large group of users, including small business owners and advanced webmasters. Car Rental script is offered under two different licensing options. With a Developer licence you receive full PHP source codes and you are allowed to use the script on all websites that you build for your clients. You are also allowed to make your own amendments to the rent-a-car script. With a User licence you receive Zend Guard encrypted files and you are not allowed to modify the PHP code. Free installation support is included with both packages. Car Rental script supports PayPal and Authorize.net payments as well as an option for credit card payment; it has a built-in automatic message system which allows you to send confirmation emails to your clients after a booking or payment is made.